4 oz. 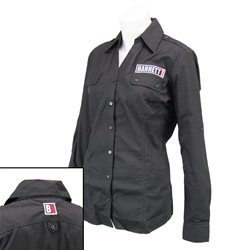 60% cotton/40% polyester long sleeve shirt with button tabs to hold rolled-up sleeves in place. Features epaulets, two chest patch pockets with button flaps, and back yoke. Accented with princess seams, an open neck and decorative two-button cuffs.